She's playing political theater against a master. And the master has just pulled a stunning move, stopping Pelosi from using military transport. UPDATE: Well, we said don’t try to get into a political theater battle with one Donald J. Trump. And sure enough, this afternoon, President Trump barred Speaker Nancy Pelosi from using military planes during the shutdown. Thing is, Pelosi was set to take off this afternoon for a trip to Brussels, Egypt and Afghanistan. Here is his letter. Oh, Nancy, Nancy, Nancy. Did the fun in the sun junket to Puerto Rico singe a few brain cells? Did seeing Hamilton make you think you should be theatrical? Did you just not want to stay up late to attend the State of the Union? First, let’s get this out of the way. As Speaker, Nancy Pelosi has every right to invite or not invite President Trump to deliver a speech to Congress. No president can just march up Pennsylvania Avenue to the Capitol and take the podium. Not the way it works. They need an invite. They need any request to speak accepted. Nancy can say it’s a bad night to come because she is getting the carpet cleaned and it won’t yet be dry. Further, the Constitution only requires the president to deliver to Congress one report from time to time on the state of the union. For roughly 150 years, presidents sent over a written document. It wasn’t until Woodrow Wilson that we started enjoying the annual ritual of a president going to Capitol Hill and addressing Congress and the nation. President Trump could, if he wanted, send a post card. Or even a tweet @SpeakerPelosi. Sure, it is rather nice to see the President, Congress, the Cabinet and the Supreme Court Justices in one place. The pomp, the symbolism, the history, the wonderful shots of the Capitol Dome lit against the dark Washington sky … it’s one of the grandest spectacles of American democracy we have. But it is not required. And typically, the speeches are forgotten by week’s end. 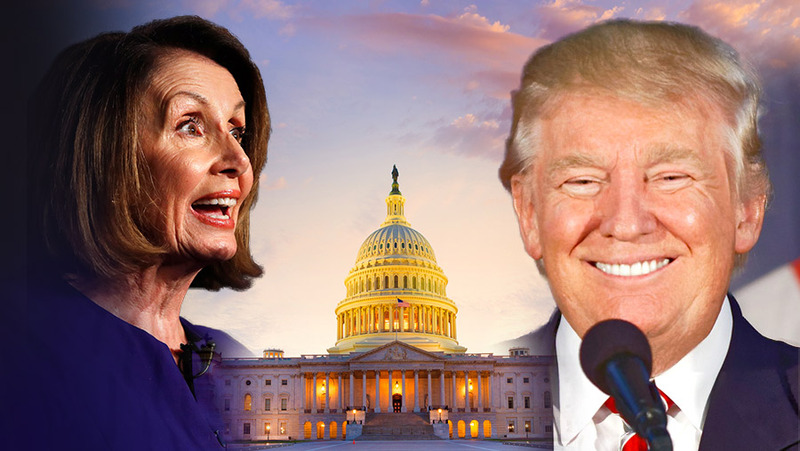 Sure, having President Trump deliver his first State of the Union in front of a Democratic Congress would be the stuff of high, prime-time drama. Then again, with the Trump presidency, drama is part of your regularly scheduled programming. Which gets to why Pelosi’s move could be a colossal mistake. Her move is 100% political theater. The problem is, she is playing political theater with the Shakespeare of our generation. Trying to Show Up a Master Showman? Closing the door to the House opens the door for Trump, The Donald, the master of marketing and media manipulation. The Showman. You know, the guy who made tens of millions off the phrase “You’re fired.” The guy who got people to buy his own brand of water. The guy who turned a slogan on a simple red hat into a national movement. The guy who made 16 top-notch, big name GOP candidates look like day players on The Trump Show. The guy who drew 30,000 to corn fields in the middle of nowhere in support of no-name Senate candidates. The guy whose every tweet is examined as closely as the Zapruder film. The guy whose every move dictates what both the news and entertainment worlds talk about. The guy who just two days ago owned the media cycle with just a stack of Big Macs. You want to get into a political theater match with this guy? You’re better off getting into a dunking contest with Lebron James. A singing contest with Streisand. An eating contest with the Clemson offensive line. It’s possible Trump says, “Sure, Nancy. No problem. I’ll wait. Your house, your rules.” Sometimes being surprisingly agreeable is good strategy. The more agreeable Trump acts the more hysterical the Democrats seem to get. I mean, not even coming over for a lunch meeting Tuesday? How smart is it to make Trump seem like the rational and welcoming one? So much for the “temper tantrum” meme. So much for the 25th Amendment because he’s a madman meme. Fine. You don’t want me in your Little House on the Swamp? I’ll go to the heart of roaring, booming America. In fact, we’ll make it a border state. How’s AT&T Stadium sound? Not like the Cowboys will be using it. Deliver the State of the Union to 100,000 real Americans rather than a bunch of sour pusses who will sit on their hands all night anyway rather than celebrate the good things that are happening. In fact, after AT&T Stadium, we’ll take it on the road. Hit urban areas that are seeing opportunities for the first time in a decade. Hit San Francisco to show off the filth in your own district. Hit the parts of California that are still sane and desperate for relief from sanctuary cities. Hit the Dakotas to celebrate the booming economic sectors. Hit the Steel Belt, alive for the first time in a generation. Hit the Long Island neighborhoods being freed from MS-13 control. Sounds a lot more fun than one night with a bunch of stuffy, shrill politicians and pundits. And you know what, Nancy? You’re welcome to come along. The great American train is gaining steam. Join with me and it can be a heckuva ride. Now that would be some political theater worth the ticket and surcharge.